Together, these four classes are worth twelve credits, which is the typical load that I take. Currently, I have 86 credits. I anticipate adding another 15 at the end of the fall semester. That will give me a total of 101 credits and leave me with 19 more to complete before I can graduate. Together, these classes are worth a total of 18 credits. After these have been completed I will have 1 credit hour leftover. I have gone back and forth on my decision whether or not to minor in Spanish. On the one hand, a minor in Spanish could potentially give me credibility as a fluent speaker of Spanish and thereby afford me more job opportunities. On the other hand, I may not need it and I would be able to graduate sooner without it. These classes combined are worth a total of 15 credits. That *is* a lot for me to take at one time, but I think I'll be able to handle it. I've had two other six credit hour Spanish classes in the past: SPAN 109 and 209. Those were a lot of work and despite that, I did very well with them. I'm sure that the anthropology class will be much more interesting to me than the alternative, IT 103. When I was a student at ERAU (Embry-Riddle Aeronautical University), I was required to take Intro to Computing. As far as I can tell, the class material was similar to what is being taught in IT 103, but when I came to GMU it transferred in as just an elective. I wouldn't learn anything dramatically different in IT 103 and in order for me to get motivated to learn, I have to be offered something new and challenging. LING 499 is an independent study class that I will be taking with Dr. Goldin. Last semester I took SPAN 301 Grammar and Syntax with him. Being already familiar with a professor's particular teaching style seems to help and besides, it shouldn't take away much from my other classes because most of what I will be doing for my independent study is reading. As for the Shakespeare class, I won't know what to expect until after I've met my professor. This morning I had my annual appointment with my neurologist. I have been seeing him for the treatment of my migraines. I don't get them as often now that I am on a small, nightly dose of Pamelor. However, this summer has been unusual for me in that I have suffered two headaches for seemingly no reason at all. Usually there are triggers that set them off. The most common one for me is stress, but typically I also have to be short on sleep and have skipped a meal or two in order to induce a migraine. These were not factors as far as these two incidents were concerned. I discussed them with my doctor and he explained to me that some migraines just occur for no reason at all. I also described something else that happened to me about two months ago. It was late at night and I had been sitting in front of the computer reading about one man's experiences (or should I say experiments with) Olestra (more popularly known as Olean). I was pretty grossed out by the end of it and I got up to get ready for bed. As I was making my way to the bathroom to gather my pills a strange feeling began to come over me. It is somewhat difficult to describe. I suppose that I was lightheaded. I started to see stars, but I was determined to keep on going. With pills in hand, I made my way out of the bathroom and collapsed in the foyer. I hit my head on the PS cabinet (a metal locker manufactured by IKEA) on the way down. On the floor, I was disoriented and couldn't tell which way was up. At that point the stars had totally obscured my vision. I reached out for the cabinet and broke one of my fingernails when I got it caught inside one of the vents. I remained still and eventually the sensation subsided. I tried again and this time I managed to grab onto something useful. I pulled myself up and quickly determined that I needed to get to Andrew, who was asleep. Using the wall for support, I made my way into the bedroom and onto the bed before the feeling completely came over me again. My neurologist thought that this incident was possibly attributable to my medication. He took my blood pressure a few times with me seated and once with me standing. He said that it was normal. Later, he explained that during a fainting episode, which is what I had, a person's blood pressure drops. His advice to me was if it happens again just stay put until it passes. Ok, so it turns out that I came across some pictures I was holding onto ever since Thanksgiving. I swear, I'm really not withholding anything more from you people. This is the turkey breast before it went into the oven. 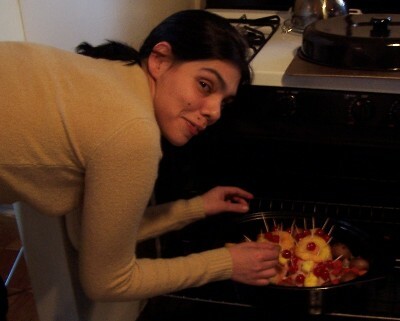 That's our good friend Paola, who is originally from Argentina, checking on the turkey's progress. And yes, those really are cherries and pineapple slices that you see pinned to the bird. Only -4884 days left until fall semester ends!